Introduced in Scia Engineer 2013, the Engineering Report has brought a whole new level of efficiency to structural engineers, greatly speeding up the sometimes tedious task of creating and updating calculation reports. Since then, we keep our focus on further improving it in Scia Engineer 2013.1 and also the upcoming Scia Engineer 14 will bring several important enhancements. In Scia Engineer 2013, the Engineering Report brought many innovative and productive features, like a modern ribbon-based UI, support of the standard Windows clipboard for text, pictures and even document items themselves! It is able to run on a separate core, the same as the main Scia Engineer application, which results in increased speed and stability. And of course, it supported export to 3D PDF. Development continued with Scia Engineer 2013.1 that improved the speed and memory-efficiency of work with pictures, enabled pictures in ChapterMaker leading to a very quick creation of complete and structured reports, introduced Frames to enable free placement of elements on a page, a WYSIWYG preview of formatted text, “zoom all” for pictures, full support for Undo/Redo, splitting of narrow tables and export to RTF to obtain increased fidelity in Word. What will Scia Engineer 14 bring you? As requested by users, we introduced the possibility to create report templates. These templates can also be partial, meaning that a user can compose a new report from several partial templates: one for frames data, one for surfaces data, one for loads, and for example one for reinforcement results! This gives a very high efficiency as well as flexibility in the creation of new reports. 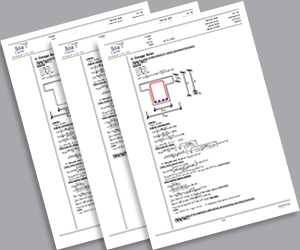 Scia Engineer 14 also comes with a library of standard (partial) report templates created by us. It will be possible to include several independent Design Forms in a report. The Form can be launched simply by double-clicking on it. The results of the Form are saved together with the ESA project. This makes it possible to create your own additional calculations and create a clean, consistent report for both the 3D model with results and the additional calculations. Editing of multiple pictures: change of viewpoints, view parameters, etc. Stay tuned for the upcoming release 14 of Scia Engineer, in May!